Britain is a world leader in community involvement with railways. Across the country, there are now more than 50 community rail partnerships, hundreds of ‘station friends’ or station adoption groups, and scores of examples of community organisations making great use of railway buildings and land. The benefits can be wide-ranging, to communities and the railways and their passengers. 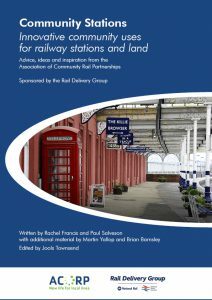 The “Community Stations: Innovative community uses for railway land” report, commissioned by the Rail Delivery Group, highlights many outstanding examples, covering diverse activities involving community groups, train operators and Network Rail. These case studies only scratch the surface, although we show a range of activities to do with arts and heritage, local food, and mixed-uses. This report follows The Socially Enterprising Railway, published by ACoRP in 2016 with backing from RDG. The emphasis here is slightly different, on the role of community organisations: groups that are not-for-profit and owned, in some form, by their local communities, whether un-incorporated voluntary groups, charities or local social enterprises.